Togo is delighted to host the African Union extraordinary summit on maritime security and safety and development in Africa in Lomé this Saturday. For Africa as a whole, the date of 15 October 2016 will mark a major milestone in its march towards the fulfilment of its destiny. The aim of this summit, which brings together heads of state and government, is to consider the ways and means of creating the best possible conditions of safety and security on the seas and oceans of Africa, to ensure profitable exploration and exploitation of these spaces for our peoples. Everyone is aware of the challenge and of how important the seas and oceans are to humanity. Indeed, two-thirds of the surface of the globe is covered by sea, an element so necessary, essential even, for life on earth. The seas and oceans, these assets that are so valuable, so vital, deserve our protection so that we can make best use of the considerable resources they provide. The sea and oceans are the original and ultimate way to build friendships and cooperation among peoples and states. They are, in no uncertain terms, the main vectors of globalization, on the one hand, with approximately 90% of world trade transported by sea, and on the other, key factors in sustainable development. A source of energy and wealth, activities associated with the sea are an important element of growth, and essential to the development and evolution of our countries. The central role played by the oceans and seas in human existence and progress is widely recognised, hence the imperative incumbent on the international community in general, and on African states in particular, to promote and take appropriate steps to ensure the safety and security of maritime spaces. This is why the issue of combating maritime piracy and illegal trafficking of all kinds conducted by sea will remain the focus of our discussions, and of the proposed measures and action to be taken to discourage and incapacitate the perpetrators of these wrongful acts. Examination of the issues of illegal, unreported and unregulated fishing and the blue economy testifies to the interest that our countries attach to their marine resources, enormous sources of wealth for our peoples. In this regard, it will take bold African initiatives to strenuously discourage the unauthorised and fraudulent fishing that results in a huge loss of income for our economies and considerably reduces job creation opportunities for our young people, a fundamental indicator of social cohesion, peace and security in a society built on well-distributed prosperity. Isolated or individual action is unlikely to effectively suppress the unfortunate and harmful phenomena our maritime spaces are experiencing. Working together and taking collective, affirmative action are the only ways in which we will be able to best protect the valuable assets that are our seas, our oceans and their resources. It is important that future generations can also make use of these assets that will contribute to their well-being and to the development of their full potential. This explains, therefore, the importance of the Lomé summit, which was called to launch a framework of collective, dynamic and effective action that, by means of a binding legal instrument, the future ‘African Union Charter on maritime security and safety and development in Africa’, would enable the African Union and all of its member states to ensure the security of their maritime spaces, and to enhance their marine resources and make them more productive for the benefit of their populations. The African Union (AU) extraordinary summit on maritime security opened in Lomé on Saturday. The 17 heads of state in attendance took their places alongside vice-presidents and government leaders in a huge marquee that served as a conference centre. The President of Togo, Faure Gnassingbé, summarised the new threats the continent faces; maritime piracy and criminal organisations. He advocated coordinated and concerted action to combat these scourges. The charter on maritime safety that was discussed during the morning and adopted in the afternoon is a roadmap, an instrument of cooperation to make oceans an area of peace and joint prosperity, said the head of state. This charter will define the new frontiers of the African renaissance, he said. Following him to the rostrum, the Under Secretary-General of the United Nations, Carlos Lopes, urged African countries to work together to anticipate and manage the dangers emanating from the sea. The Chairperson of the AU Commission, Nkosazana Dlamini-Zuma, also called upon member states to establish a real maritime industry and floated the idea of creating an African maritime bank to incentivise the private sector. Finally, the President of Chad and Chairman of the AU, Idriss Déby Itno, also expressed his support for the Charter. 17 African presidents were in attendance, as well as the vice-president of Nigeria. The most recent arrivals were the heads of state of Ghana, Burkina Faso and Benin. This was a well-attended African Union summit. On the eve of his participation in the Lomé Summit, Karmenu Vella, European Commissioner for the Environment, Maritime Affairs and Fisheries, officially launched a project led by the European Union and Denmark, aimed at developing an inter-regional network for maritime security in the Gulf of Guinea (GoGIN). The GoGIN project, co-financed by the European Union (EU) and Denmark, contributing €7.5 million and €1.8 million respectively, will support the networking and sharing of information between national maritime security mechanisms and regional coordination platforms set up in the countries of the Gulf of Guinea. This new project builds on the Yaoundé Process and is part of the EU’s Strategy and Action Plan for the Gulf of Guinea, which were adopted in 2014. The project’s operational implementation will be conducted by Expertise France. European Union action in this area is based on an integrated approach that links the challenges to be faced in terms of security, governance and development both at sea and on land and draws upon the lessons learned from experiences in the Horn of Africa. ‘The cost of piracy in the Gulf of Guinea in 2014 is estimated to be approximately $1 billion. But in fact, the overall cost of maritime insecurity is far greater, particularly in terms of jobs lost within the European Union, but even more so in Africa,’ he concluded. Some 25 to 30 heads of State and Government are set to take part in the Lomé summit and more than a dozen Presidents have already confirmed their attendance on 15 October, said Robert Dussey on Thursday. The Minister for Foreign Affairs also announced the attendance of 3,000 delegates, which equals the number of police officers on hand to oversee security at the event. Mr Dussey talked about the draft charter on maritime security which will be discussed and potentially adopted. “We are very proud to support this project. Togo has done all it can to ensure that the Lomé charter will be adopted. All the internal validation procedures of the African Union have been complied with”, he went on. A number of themed presentations will also be held alongside the summit. Eighty international experts will take part in roundtable discussions on combating maritime piracy and illegal fishing, as well as promoting the blue economy. The last international summit organised by Togo dates back 16 years. The country has pulled out all the stops to make this meeting a diplomatic success. In June 2013, Cameroon organised the first summit on maritime security in the Gulf of Guinea, one of the regions most affected by piracy throughout the globe. Pursuant to a resolution of the United Nations Security Council, the countries of ECOWAS and ECCAS were invited to establish a regional collective strategy to combat maritime piracy and armed robbery in territorial waters. Three years on, another summit is set to take place, this time in Togo, under the auspices of the African Union, aimed at the adoption of a binding charter. This issue was the key focus of an interview held on Friday at the United Nations Headquarters in New York between the President of Togo, Faure Gnassingbé, and the President of Cameroon, Paul Biya. The forthcoming summit in Lomé follows directly on from the recommendations made in Yaoundé, but the African States want to go further in light of the threats posed by piracy and trafficking to maritime commerce and regional trade. From the Togolese authorities’ point of view, maritime insecurity also hinders development. 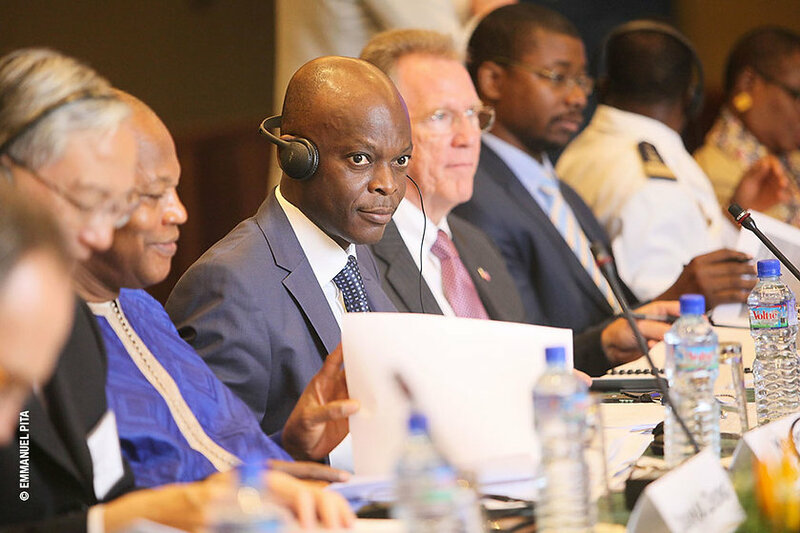 The United Nations will support the Lomé summit on maritime security, said Mohamed Ibn Chambas, the UN Secretary General’s Special Representative for West Africa, on Friday. The statement came following a meeting in New York with President Faure Gnassingbé. “The UN is very interested in this summit. It is an opportunity for the whole of Africa to set out a comprehensive approach to combating piracy, not only in the Gulf of Guinea but in Africa in general. Concrete results are expected”, said Mr Chambas. UN representatives will take part in the African Union summit on maritime security and development to be held on 15 October in Lomé. With less than a month to go before the Extraordinary Summit of the African Union (AU) in Lomé on maritime security, the head of Togolese diplomacy, Robert Dussey, was a guest on RFI’s “Afrique Soir” on Tuesday. He referred to the draft charter, which will be discussed and doubtless adopted at the close of the event. “In order to safeguard maritime security, we need to move towards a binding text. The charter has a section on security and another on development. It is essential to promote the blue economy”, he said. The 3rd international “Our Ocean” conference ended on Friday in Washington. At the conference, US Secretary of State John Kerry, the man behind this project, reminded attendees that in order to protect the climate, we must also protect the ocean. At the close of the event, he announced the establishment of 40 marine protected areas, including one between the United States and Canada. Minister for Foreign Affairs Robert Dussey, who attended the event, welcomed the inclusion of the ocean in international climate negotiations. Particularly since the head of Togolese diplomacy believes that marine space, particularly in Africa, represents an area for economic development. Moreover, the blue economy will be one of the key themes of the forthcoming summit on maritime security in Lomé. “Saving the oceans is not an option or a priority, but an absolute necessity”, stressed Kerry. In addition, he indicated that pollution and acidification are linked to the appearance of some 500 dead zones in the seas and oceans (areas in which the oxygen content is too low to ensure the survival of marine fauna and flora), warning that illegal, unreported and unregulated fishing is damaging to the marine environment, employment and to global food security. Subsequent editions of “Our Ocean” will be held in Malta, Bali and Norway. In parallel to the event, Robert Dussey met with Catherine Novelli, the US Undersecretary for Economic Growth, Energy, and the Environment, and with Heraldo Muñoz, the Chilean Minister for Foreign Affairs. At the invitation of US Secretary of State John Kerry, the Togolese Foreign Minister has, since Thursday, been taking part in the 'Our Ocean’ conference in Washington. Robert Dussey is participating in this international conference ahead of the African Union Summit on Maritime Safety to be held on 15 October in Lomé, and the adoption of a charter containing a section that deals specifically with protecting the oceans against pollution. Issues relating to the protection and conservation of the seas are at the very heart of the discussions in the US capital. Ninety countries sent representatives to report on the state of play three years on from the first conference. Barack Obama called for vigorous and rapid international mobilisation in favour of the oceans, which face “new threats”, and announced the creation of a nature reserve in the Atlantic to protect threatened ecosystems and species. Citing unsustainable fishing practices, among others, he stressed the urgent need to make the ocean more resilient to climate change, which has profoundly changed life under the water. For his part, John Kerry called on the international community to take action to combat illegal fishing and to fight against pollution. “At this rate, soon there will be more plastic bags than fish in the ocean”. One of the speakers humorously called on the world’s leaders to switch their focus from the ego-system to the eco-system. In parallel to the discussions, Robert Dussey met with the President of Mauritius, Ameenah Gurib-Fakim, the head of Chilean diplomacy, Heraldo Muñoz, and Ambassador Linda Thomas-Greenfield, advisor to Barack Obama at the Bureau of African Affairs. On Sunday, Robert Dussey was a guest on international French-language channel TV5. He talked at length about the upcoming African Union Summit on Maritime Security to be held on 15 October. Though the draft charter on this theme was approved at the weekend by the Justice Ministers of AU member countries, he hoped that the bill would be adopted by the heads of State and Government. He said he was confident in this regard, while stressing that it was not easy to get 54 countries to agree to the same document. Asked about illegal fishing - mainly industrial fishing - which puts African coastal countries at a disadvantage, Mr Dussey said he hoped the Lomé meeting would provide an opportunity to issue a warning, or indeed more, to countries engaging in this activity. The development of local fishing is essential and has a key part to play in promoting a blue economy, said the head of Togolese diplomacy. 3,000 participants are expected in Togo’s capital in mid-October. Lomé has not organised an event of this type for over fifteen years. As such, the authorities rightfully want to ensure that everything goes smoothly. On Thursday, Togo’s President Faure Gnassingbé completed an official four-day visit to Israel, his second since 2012. He met with President Reuven Rivlin during the day, and later attended an official dinner with Prime Minister Benjamin Netanyahu. Following these two meetings, the Togolese Ministry of Foreign Affairs issued a communiqué which noted that the Israeli Prime Minister and the Togolese President “expressed their appreciation for the very friendly and cooperative relationship between Togo and Israel, which has been enormously fruitful since diplomatic relations were established (...)” and that “as part of this special relationship, they plan to enhance mutual trust and expand cooperation to other areas in order to enrich the long-standing relationship between the two countries”. The two men said they were “confident in the extraordinary potential of Israeli-Togolese economic cooperation” and expressed “their determination to work together to become stronger, particularly in the areas of agriculture, public health, education and higher education, technological sciences, the digital economy, community development, security, social protection and promotion, and the integration of women into the development process”. With regard to regional matters, President Gnassingbé and Prime Minister Netanyahu agreed to hold an Israeli-African summit in Lomé centred around the theme of “security and development”, with the aim of strengthening cooperation between Israel and Africa. The statement mentioned that President Faure Gnassingbé “had conveyed his warmest thanks and deepest appreciation to his brother and friend Benjamin Netanyahu, to President Reuven Rivlin, to the Israeli government and people for the warm and friendly welcome he and his delegation received, and invited the Israeli PM to pay a visit to Togo”. 1-As part of the cooperative relationship that unites Israel and Togo, and at the invitation of HE Mr. Benjamin Netanyahu, Prime Minister of Israel, HE Mr. Faure Essozimna Gnassingbé, President of the Republic of Togo, paid a goodwill and working visit to Israel from 7 to 11 August 2016. 2- During this visit, Prime Minister Benjamin Netanyahu and Togolese Head of State Faure Essozimna Gnassingbé had an in-depth exchange of views concerning bilateral and multilateral issues of mutual interest. 3- On the bilateral front, the Israeli Prime Minister and the Togolese Head of State expressed their appreciation for the very friendly and cooperative relationship between Togo and Israel, which has been enormously fruitful since diplomatic relations were established between the two countries. As part of this special relationship, they plan to enhance mutual trust and expand cooperation to other areas in order to enrich the long-standing relationship between the two countries. 4- The Togolese President and the Israeli Prime Minster are also confident in the extraordinary potential of Israeli-Togolese economic cooperation, expressing their determination to work together to become stronger, particularly in the areas of agriculture, public health, education and higher education, technological sciences, the digital economy, community development, security, social protection and promotion, and the integration of women into the development process. 5- With regard to regional matters, President Gnassingbé and Prime Minister Netanyahu agreed to hold an Israeli-African summit in Lomé centred around the theme of “security and development”, with the aim of strengthening cooperation between Israel and Africa. 6- Addressing the international situation, the two men expressed serious concern at the surge in terrorist acts and the persistence of crises threatening peace, security, stability and development around the world. 7- In this regard, they reiterated their strong condemnation of terrorism in all its forms and called for the coordination of efforts and continued international cooperation to overcome this scourge. 8- With reference to the forthcoming African Union Extraordinary Summit on Maritime Security and Safety and Development in Africa, involving heads of state and government, the Israeli Prime Minister praised Togo’s efforts in peacekeeping and in organising this summit. In this regard, he expressed his strong hope that this meeting would be a success and his wish for all parties involved to work in good faith with the aim of adopting and signing the Lomé Charter on Maritime Security and Safety. 9- At the end of his visit, HE Mr. Faure Essozimna Gnassingbé conveyed his warmest thanks and deepest appreciation to his brother and friend Prime Minister Benjamin Netanyahu, to President Reuven Rivlin, to the Israeli government and people for the warm and friendly welcome he and his delegation received, and invited the Israeli Prime Minister to pay a visit to the Republic of Togo. 10- The Israeli Prime Minister accepted this invitation and arrangements for this visit will be made through diplomatic channels. The Africa–China–United States Consultation for Peace in Africa took place on Wednesday, 27 July 2016 at the Hotel Sarakawa in Lomé, Togo. This meeting was arranged by Togo’s Ministry of Foreign Affairs, The Carter Center and the United Nations Office for West Africa and the Sahel (UNOWAS). The two topics on the agenda were maritime security and the blue economy in the Gulf of Guinea, and promoting peace in the Sahel. These talks took place in the run-up to the African Union summit on maritime security due to be held in Lomé on 15 October. This is a challenge that continually questions our ability to confront and overcome it, given the ever-increasing number of victims of armed conflicts and terrorist atrocities, Mr. Dussey added. He acknowledged that the measures taken were not yet yielding the anticipated results, due to insufficient cooperation. “Faced with this bitter realisation and these somewhat mixed results, it is therefore all the more urgent that we reappraise and take the minimum time necessary to consider and plan our actions more effectively”, he emphasised. Calling for strengthened security cooperation is The Carter Center’s leitmotif; it is a strategy to which Togo subscribes wholeheartedly, said its Foreign Minister, who believes that the Africa–China–United States Consultation for Peace in Africa represents a unique multilateral forum for collaboration, capable of contributing to the global action for peace on the continent, including the improvement of maritime security. “Conflict, violence and terror seem to be eluding our grasp and our control. The Sahel remains an unstable and fragile area; piracy and trafficking of all kinds hold sway over our coastal waters and the threat of terrorism has never been so acute [...]”, the Togolese Minister of Foreign Affairs warned. Launched in 2014 by the former US President Jimmy Carter, the Head of The Carter Center, and the President of the People’s Republic of China, Xi Jinping, the consultation brings together a core group of African, Chinese and American diplomats and experts for closed-session talks to explore collaboration between regional players, China, the United States and others on matters of peace and security. This working group is led by Zhong Jianhua, China’s special envoy for African affairs, Ambassador Princeton Lyman, special adviser at the United States Institute of Peace, and Mohammed Ibn Chambas, special representative of the UN Secretary-General in West Africa. The initiative aims to promote a collective focus on mutual concerns and identify specific areas for collaboration. A non-governmental organisation, The Carter Center was founded in 1982 by former US President Jimmy Carter. On Monday, Portuguese Foreign Minister Augusto Santos Silva, alongside his Togolese counterpart Robert Dussey, will chair the opening of the G7 Friends of the Gulf of Guinea Group (G7++FoGG) meeting in Lisbon. Attendees will discuss the implementation of the regional framework for maritime security, adopted in 2013 at the Yaoundé Summit. They will also review the various international initiatives on maritime security, the strengthening of projection capabilities, judicial and police cooperation and the fight against impunity and transnational crime. Robert Dussey will set out the aims of the next African Union summit, to be held on 15 October in Lomé, Togo. The aim is to secure the adoption of a new African charter on maritime security. Portugal is this year’s President of the G7++FoGG. This group includes the United States, Germany, Canada, France, Italy, Japan, the United Kingdom, Belgium, the Republic of Korea, Denmark, Spain, Norway, the Netherlands, Portugal and Switzerland, and Australia and Brazil as observers. The European Union, the United Nations Office on Drugs and Crime and Interpol are also involved in this process. As a sideline to the meeting, Robert Dussey will meet with Augusto Santos Silva. They will discuss trade, bilateral cooperation, regional security, the political situation in Guinea Bissau and the fight against terrorism. On Monday, the Foreign Ministers from Portugal and Togo, Augusto Santos Silva and Robert Dussey, chaired the opening of the G7 Friends of the Gulf of Guinea Group (G7++FoGG) meeting in Lisbon. Attendees discussed the implementation of the regional framework for maritime security, adopted in 2013 at the Yaoundé Summit. They reviewed the various international initiatives on maritime security, the strengthening of projection capabilities, judicial and police cooperation and the fight against impunity and transnational crime. In his statement, Augusto Santos Silva stressed the need for coordination between the Gulf of Guinea states in the fight against piracy. “Let us not deceive ourselves, the Gulf of Guinea is the world leader for piracy based on the number and the gravity of attacks. Furthermore, we are seeing a sharp increase in trans-regional drug trafficking. Unreported and unregulated illegal fishing has a drastic negative effect on local economies. Security and development are closely linked; we must therefore consider targeted solutions,” said Santos Silva. Mr Dussey believes that the next African Union summit on maritime security (to be held in Lomé, Togo on 15 October 2016) will provide an opportunity to sign a binding document. The AU Committee has ratified the draft charter that is to be adopted in Lomé. The participants confirmed that they would be attending in Togo. This group includes the United States, Germany, Canada, France, Italy, Japan, the United Kingdom, Belgium, the Republic of Korea, Denmark, Spain, Norway, the Netherlands, Portugal and Switzerland, and Australia and Brazil as observers. Three new countries were added as observers on Monday – Greece, Turkey and Uruguay. The European Union, the United Nations Office on Drugs and Crime and Interpol are also involved in this process. On Monday, Horst Seehofer, Prime Minister of Bavaria and Chairman of the Christian Social Union (CSU) party in Bavaria, held talks with President Faure Gnassingbé in Munich. The talks focused on bilateral cooperation, with the parties expressing their determination to encourage large local companies to invest in Togo. They also addressed the migrant crisis, which is a sensitive issue in the region, because Bavaria plays host to a large number of the refugees that have recently arrived in Germany. This evening, President Gnassingbé is attending a state dinner held at the castle of the former King of Bavaria. President of The Republic of Togo, H.E Faure Essozimna GNASSINGBE has attended the 2nd Regional Security Summit at Abuja, Nigeria, on May 14TH 2016. Dedicated to the fight against Islamic Group Boko Haram, Heads of state of the Lake region, Western Africa and Center have decided to find a quick solution to this humanitarian crisis which results from terrorism actions and to ensure more efficient coordination between different units. Togo Minister of Foreign Affairs, Mr. Robert DUSSEY, has met his French Homologue Jean-Marc Ayrault at Quay d’Orsay, Paris, on May 13TH. Topics have included the bilateral cooperation between Lomé and Paris and security in West African sub-region. It has been also the opportunity to inform his French counterpart of the preparation for the next African Union Summit about the Maritime security which will be held on October 15TH,2016 in Lomé. France is deeply involved in peacemaking and security operations in Africa, and will participate in this summit in Lomé.